It says much about the nature of cricket at Edgbaston that it was something that didn't happen on the final day which caused more excitement than anything that did. Michael Vaughan's inability to bat shed further doubt on the likelihood of an England recall. Vaughan felt pain in his hamstring while chasing a ball in the field early in the day and spent the remainder of the match in the dressing room. He will travel with the Yorkshire squad for their Friends Provident game in Bristol on Monday, but is described by the team's director of cricket, Martin Moxon as "a doubt" to play. There was a time when fears of an injured Vaughan would keep England selectors awake at night. Not any more. With Ravi Bopara nailing down England's number three shot, Vaughan's chances of a recall are dim. Out of contract with England and Yorkshire at the end of the season, it may well be that his days as a cricketer are coming to an end. There was little on-pitch drama on the final day. Though Yorkshire surprisingly declared at tea, there was never much hope of them dismissing Warwickshire in 36 overs on this surface. The declaration was little more than a positive gesture. The result puts both teams into a mid-table position, though neither yet have a win. 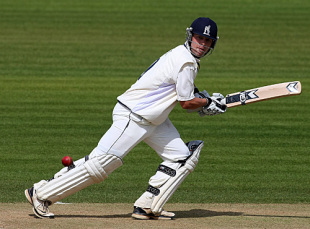 Warwickshire extend their unbeaten Championship run to 19 games, which sounds impressive, but they have won only one of their last 16 matches at home. Yorkshire, too, have only won twice since the start of 2008, with both teams favouring a safety first approach. Four day county cricket has become an attritional affair. Perhaps things might have been different if either side had taken all their catches. Most crucially, Gerard Brophy's failure to cling on to Jonathan Trott when the batsmen had just 26 on the third day may have cost his side the game. The risk of playing a batsman with little wicket-keeping pedigree in such a key position has rarely been better illustrated. As it was, Trott and Jeetan Patel extended their overnight partnership to 233 in 47 overs. It is the ninth highest ninth-wicket partnership in first-class history and overhauled the record for the wicket against Yorkshire. The previous mark was 160, added by Denys Wilcox and Ray Smith of Essex at Southend in 1947. Patel also had cause to celebrate his maiden first-class century. Reached with a cut for four that also averted the follow-on, Patel became the first man to score a century on Warwickshire first-class debut since Kumar Sangakkara in 2007. Patel's was a chanceless affair that suggested a batting talent that has so far gone unfulfilled; there was nothing fortunate about it. The timing of his dismissal was somewhat unfortunate, however. Attempting to thrash the final ball of the 120th over back over the head of the bowler, he succeeded only in lofting an easy catch which gifted Yorkshire a full allocation of bowling bonus points in the nick of time. Boyd Rankin soon followed, trapped in front by a yorker, to earn Yorkshire a first innings lead of 118. Trott, who faced little of the bowling on the final day, was left unbeaten on 161. Yorkshire soon built on their lead. Though Joe Sayers edged his attempted drive, Jacques Rudolph again looked in fine touch, driving Chris Woakes fluently and cutting the disappointing Boyd Rankin out of the attack. Rikki Clarke delivered another impressive spell, however. Again generating sharp pace and steep bounce, Clarke ran in hard and troubled all the batsmen. Rudolph sliced a drive to point before Brophy played across a straight one. Anthony McGrath added to his first-innings double-century, however, and with elegant support from Adil Rashid, allowed Yorkshire the chance to declare at tea. Warwickshire lost Tony Frost early, drawn into an edged drive, but Ian Bell and Ian Westwood resisted without undue alarm. Afterwards Ashley Giles played down any suggestion that 20-year-old Chris Woakes was close to an England call-up. "He's developing brilliantly," Giles said, "but he's still just a kid. We all have our feet on the ground and there's no need to rush him. "These wickets at Edgbaston are very similar to Test wickets, so if he can learn to bowl here it will stand him in good stead for later in his career. We've a very inexperienced bowling attack, but we've talked about playing dogged cricket. We've shown our resilience once again in this game and if we can start to take our catches, we may start winning a few matches."